FILE - In this Nov. 6, 2018, file photo, Sen. Amy Klobuchar waves to supporters after winning re-election during the Democratic election night party in St. Paul, Minn. Klobuchar will be in Iowa on Saturday, Dec. 1, 2018. As potential Democratic White House hopefuls begin making trips to Iowa, the party will have to decide whether a pragmatist has a better chance to take the White House than someone with a more inspirational personal story. Sen. Amy Klobuchar of Minnesota announced Sunday that she is running for the Democratic nomination for president in 2020. "We are tired of the shutdowns and the showdowns, of the gridlock and the grandstanding," she said at a speech in Minneapolis. "Today ... we say enough is enough." Klobuchar's announcement was somewhat marred by a series of recent media reports documenting her alleged routine mistreatment of staff. HuffPost reported that at least three people withdrew from consideration to lead Klobuchar's 2020 campaign, in part because of her alleged behavior toward aides. Klobuchar first ran for the Senate in 2006. In 2018, she was re-elected for the third time with 60.3% of the vote in a state where Trump received 44.9% of the vote in the 2016 presidential election. Sen. Amy Klobuchar, a Democrat from Minnesota, announced she will [launch an exploratory committee] to run for the Democratic nomination for president in 2020. 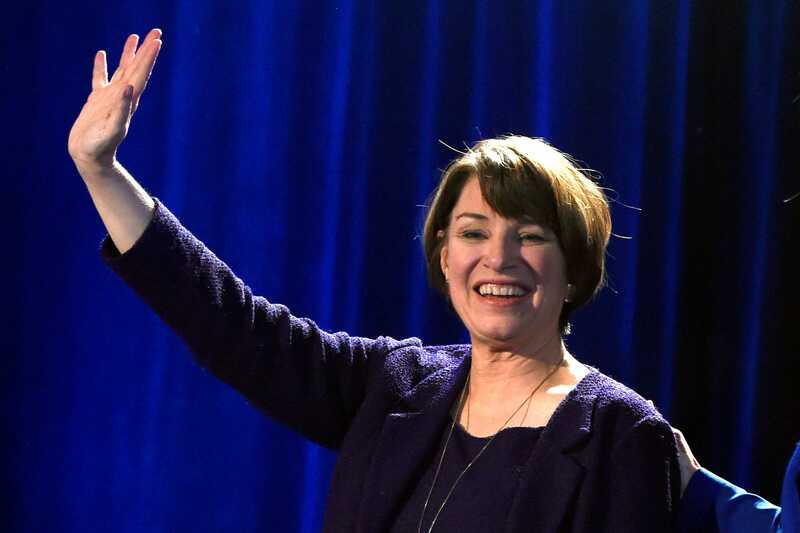 Klobuchar kicked off her campaign Sunday in a speech in Minneapolis. "We are tired of the shutdowns and the showdowns, of the gridlock and the grandstanding," she said. "Today ... we say enough is enough." "So today … in our nation's heartland, at a time when we must heal the heart of our democracy and renew our commitment to the common good, I stand before you … to announce my candidacy for President of the United States," Klobuchar said. She also announced her bid from her Twitter account. "Amy Klobuchar is running for president to bring people together and get things done," said a tweet from Klobuchar's account. "Join her campaign today and help ensure that no American is left behind." Klobuchar joins what is expected to be a crowded Democratic field in the race for the party's nomination for president in 2020. Thus far, Sen. Elizabeth Warren of Massachusetts, California Sen. Kamala Harris, New Jersey Sen. Cory Booker, and others have announced exploratory committees for a 2020 run. Rep. John Delaney of Maryland announced his 2020 presidential run all the way back in June 2017. Klobuchar's announcement on Sunday was somewhat marred by a series of recent media reports that document her alleged mistreatment of staffers. Among other things, aides, who spoke on the condition of anonymity, described a toxic work environment that included demeaning and cruel behavior that left staff feeling demoralized, thrown office supplies, and requests for aides to do Klobuchar's personal chores for her. HuffPost also reported that at least three people withdrew from consideration to lead Klobuchar's 2020 campaign, in part because of her history of mistreating her staff. Klobuchar, a member of the Democratic-Farmer-Labor Party (the Democratic affiliate in Minnesota) is the first woman to represent Minnesota in the Senate. After a career as a corporate lawyer and an attorney for Minnesota's Hennepin County, she ran for the US Senate in 2006 and was elected with 58% of the vote; she was reelected in 2012 with 65.2% of the vote; and for a third time in 2018 with 60.3% of the vote. Her ability to win Minnesota with high margins and appeal to rural voters in a state that narrowly voted for Hillary Clinton in 2016 (44.9% voted for Trump in 2016 vs. Clinton's 46.4%) has raised her profile and burnished her 2020 potential. Last fall, she also took the spotlight during confirmation hearings for Brett Kavanaugh's nomination to the Supreme Court. In the Senate, she is known for her ability to work across the aisle and for her work ethic. "She's tireless," DFL operative Jeff Blodgett told the MinnPost in 2018. "I don't think there's anyone in the whole Senate that works harder than she does. She's all over every big issue the state is facing, even to the smaller issues, and people know that." Each year she travels to all eighty-seven counties in Minnesota, she told The New Yorker, saying that to reach rural voters the first step is just "being there" and going where it may not be comfortable. "So that's the first measure," she said. "And not avoiding it, and then to understanding that not one size fits all."